With a thousand overamped and costumed riders jabbering away (plus my galloping deafness), I can’t believe I actually caught Tarik Saleh’s name–he’s a fellow bloggist on “Veloquent” blog. His Flickr name is “Target Salad” and his site features the hectic start of the epic “Group Ride”/race/mass hysteria which was the Singlespeed World Championship…this beard is my tribute to the great Sheldon Brown, patron saint of cyclists everywhere. ~ by jacquiephelan on September 22, 2009. Was lovely meeting you at SS champs. Loved the beard! Now back home at the desk at work, in NZ and it all seems like a dream. Thanks to you and Durango of an amazing few days – hope you can come out to NZ for our champs. Hey Jacquie, It was a pleasant surprise to see you coalesce next to me at the start and great to meet you again. 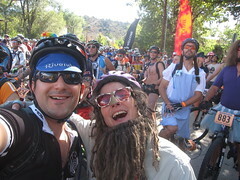 I think we met at the marin fat tire festival in 1995 or so, but I barely remember it, nor do I have photographs. Anyhow, thanks for posting the photo, and talk to you soon, maybe! J — just read your chat with Jan H. in my new Bicycle Quarterly. Now I read about your adventures in Durango and I am both happy for you and envious of you. As I prepare for my first-ever ‘cross race — on a singlespeed mountain bike, no less — I think often of you and am inspired. I will wear bright pink socks in your honor on October 4. Hi Jacquie! Great posts, and a great Bicycle Quarterly! I just got it, read the middle part of the Charlie Cunningham interview and now I have to go to work. Congratulations on everything! That picture of Charlie in his shop made me go “wow!” three times in a row. Awesome photo.